Provision of Affidavit of Claim Certificate for Legal Cover/ Protection of US$21.5Million Dollars. Please let us start by apologizing to your humble and noble person, this is because your payment file worth the total sum of us$21.5Million us dollars has just been brought to my desk for cancellation which i have to taken my time to look into your payment file to know why your over due payment should be cancel and i found out that it was because of your inability to secure your Release Approval Order Certificate (RAOC) that is why they have resolved to have your payment of us$21.5Million us dollars cancel. However, due to humanitarian ground and sympathy and because i do not want your payment cancel so i immediately called up the president to explain your matter to him as regards your payment and he personally called up a meeting which was resolved that all payment charges and any payment fee be reduced to it' s barest menial in order to enable you afford to pay the fee so that your payment will release to you today. To this end it will interest you to know that every and any fee/charges required of you have been reduced to only the sum of $105.00 us dollars this step is in order to enable you have this only fee paid so that your release approval order certificate (RAOC) is procured and acquired in other to enable the speedy accelerated transfer of your $21.5 Million us dollars into any bank account of your choice. Please we want you to know that you have till the end of today to effect the required payment so we can clear, release and effect the transfer of your fund worth us$21.5 Million us dollars in our care to any bank account of your choice, so we advice you to pay the $105. us dollars through the western union money transfer or money gram below information and send back the payment details to this office immediately the payment is effected by you now. Send the $105.00 us dollars through Western Union or Money gram. After payment has been made kindly send the below info for pick! Sender ' s Name:. . . . . .
MTCN Number:. . . . . .
Sender ' s address:. . . .
Sender ' s telephone number:. . .
We want you to know that we are indeed very sorry for any inconveniences any delay this must have caused you in having your fund paid out to you long before now. You will never ever regret paying the fee this is a promise to you after all your pains in the past as we are here to serve you as our word is our bond to you. Confirm the receipt of this e-mail by you immediately and be rest assured that you will be smiling to your bank once you comply with the above directives now. Your urgent response to this e-mail now will go a long way in helping us ensure your payment is released to you within 24 hours of you acting as instructed you now. Looking forward for your immediate response today. Dear Aloysius Katsina,we have seen your email and intention to see my PASSPORT ID before proceeding with the transaction,please try and send the $105.us dollars to equip and help us in sending your funds with immediate effect.Your fast response will determine the time your money gets to you.Here is the PASSPORT ID you asked for above. THANKS. Good day,how are you doing?i believe you are fine and kicking in preparation for your fund us$21.5 Million.We have read your email and confirmed it too,you can send the $105. us dollars through MONEY GRAM.Here are the information' s.
Send the $105.00 us dollars through Money gram. 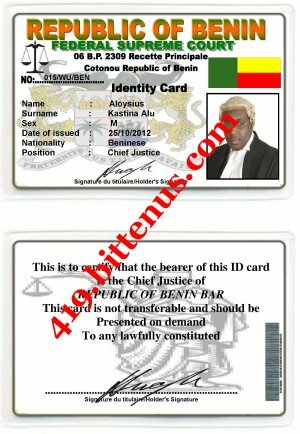 Sender ' s telephonenumber:. . . .
Subject: RE: SUPREME COURT OF BENIN REPUBLIC.